NextShould Gutenberg Replace Your WordPress Page Builder? Choosing the best backup solution for your needs can be overwhelming. After all, there are so many WordPress backup plugins to choose from, all boasting different features, and sometimes different price points. But deciding which plugin to go with is not nearly as difficult as trying to recover your website should it crash because of an internal error, hacker, or some other mysterious reason. This post contains some affiliate links. We may receive a commission for purchases made through these links. See the disclosure for more details. Even if your hosting provider offers routine backups of your WordPress website, it’s a good idea to invest in a backup solution that you can control. That way, no matter what kind of problem your website encounters, you’ll have a full backup of your website and avoid having to start from scratch and rebuild your entire website from the ground up. Today we’ll share with you the best WordPress backup plugins on the market to date so you can make an informed decision when it comes to choosing which solution will work best for you. No matter what kind of website you run, picking a WordPress backup plugin is going to protect you and all your hard work. Backup Method. Some plugins will only let you back up your WordPress database, while others will let you back up your entire website, including the database and WordPress files. Scheduling. Backing up your website manually can be a pain and something you might forget to do. Looking for a solution that lets you schedule automatic backups is sometimes the better option, especially if you make changes to your website on a regular basis. Location. These days most backup solutions will let you store your backups in a remote location such as Dropbox, Google Drive, or Amazon S3 (rather than on your site’s server) so that way you can always access your backups, no matter what happens to your website. It’s important you choose the one that lets you store your backups where you want. Now let’s take a look at the best WordPress backup plugins available! WP Migrate DB Pro is a premium WordPress plugin that goes far beyond being a backup solution. In fact, its primary use is for copying a WordPress database from one location and moving it to another, without all the headache that process usually comes with. That said, you can use this plugin to back up your site’s database, using the CLI command, and rather than push or pull it to another live site or in between your own live site and a testing environment, simply save it for another day in case you need to restore your website. The great thing about using WP Migrate DB Pro for your back up needs is that it offers a centralized remote backup solution. In other words, with CLI and server access, you can control each one of your website’s backups in a remote, yet centralized way. UpdraftPlus is one of the most popular backup plugins to date. It aims to simplify the backup process and makes restoring your website a cinch too, which many backup solutions do not do. With this plugin, you can schedule backups to run when you want and store them in cloud options like Google Drive, Dropbox, and Amazon S3. In addition, back up your database, plugins, and themes so you always have the most recent version on hand, just in case. Though the free version of this plugin comes with all the essential features you need to protect yourself from a crashed website, you can access more features, such as advanced reports, Multisite support, and automatic backups when updating the WordPress core, plugins, or themes with the premium version. VaultPress is a premium backup solution, powered by Jetpack, that gives you real-time backups and security scanning services (so you can identify issues and fix them right away). Easily back up posts, comments, media files, revisions, and even dashboard settings to the VaultPress servers for safekeeping. As a result, hackers, malware, accidental site damage, and even host outages can’t hurt you. With this plugin, you’ll receive daily automated backups, access to a 30-day archive of backups, and 1-click restore functionality. You’ll also enjoy priority support, spam protection, uptime monitoring, and an activity log so you always know what’s going on with your website. BackWPup is another free WordPress backup plugin designed to back up your entire WordPress install and save it to a remote location such as Dropbox or Amazon S3. In addition, you can repair your site’s database and restore it using a single backup .zip file. You also get free database compression, which helps your site’s speed and performance. If you need more features than what the free version of this plugin provides, you can always invest in the premium version, which offers things like complete automatic restores, backups to Google Drive or Amazon Glacier, Multisite support, and much more. BackupBuddy is one of the most expensive WordPress backup plugins on the list, but it does ensure your site is backed up and protected. Schedule automatic backups so you never miss a beat, save the entire database and all WordPress files, and send your backups to an off-site location (such as BackupBuddy Stash, Amazon S3, Dropbox, and more) so when you need them, you can access them easily. In addition, receive instant email notifications when BackupBuddy is done backing your website up, use the exclusive ImportBuddy tool to restore your website, and even repair and optimize your site’s database. WP Time Capsule is a unique, premium backup solution for your WordPress site. Rather than backup your entire WordPress website every time, which takes up a lot of time and space to store, you can back up just the changes that are made to your site – as they happen. Restore your website with a single click, test any changes or updates in the Staging site before they go live, and send all backups to the cloud app of your choice, such as Google Drive, Dropbox, or Amazon S3. This backup plugin works in the background, meaning there are no scheduled or manual backups to remember. And since you only back up changes made to your website as they happen, the load on your server is much less than traditional WordPress backup solutions, which makes for better a user experience. WP-DB-Backup is a free WordPress backup plugin that allows you to back up your WordPress database and email it to yourself for saving. That said, if you want any of your WordPress files backed up, you’ll have to do it manually. Though this may not seem ideal initially, this solution might be a good option for you if you don’t make changes to your website that often or don’t want to save all your site’s images every time. Keep in mind this backup plugin is much more complicated than the rest in this list, so if you’re not comfortable handling your site’s database or you’re just starting out with site backups, you may want to look into other solutions. And there you have it! 7 of the most sought-after WordPress backup plugins on the market today. When it comes to choosing the right backup solution, it’s important you know what your overall goal is before you dive in. Have an understanding of your budget, know whether you want to save your entire website or just the database, make sure the remote storage of your choice is available, and if you need automatic backups, check to make sure the solution you want has that too. In the end, no matter which backup solution you choose, you’ll be one step ahead of anyone that doesn’t have a backup plugin installed on their website. And that’s better than losing all your hard work to hackers, outages, or any other tragedy. Have you used any of the above mentioned backup plugins for your website? Have we left one out that you feel should be added to the list? We would love to hear all about it in the comments below! Brenda Barron is a writer from southern California specializing in WordPress and technology. When not writing or editing, she's spending time with her family, going on adventures, and knitting. Enter your details to subscribe to this blog and receive notifications of new posts and deals by email. Max Ziebell on Should Gutenberg Replace Your WordPress Page Builder? Should Gutenberg Replace Your WordPress Page Builder? Having previously started as a marketplace plugin for WordPress installs, WP App Store is now the best place for great deals on quality WordPress products. It provides a great way for makers to get their products in front of a large audience of WordPress users. It’s run by Iain Poulson. Enter your details to subscribe and get the deals. © 2019 Pole Vault Web. All rights reserved. 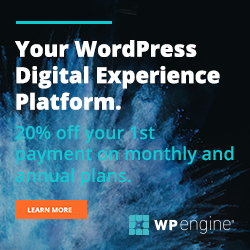 Save Hundreds of Dollars on WordPress Plugins, Themes and Hosting! Subscribe for free to get the current deals and all future ones in your inbox.